This article is about the wizard who disguised himself as "Garrison Kreiger". For the nameless Axis leader, see General Blitz. Merklynn believes one thing above all else: magic is superior to technology. A powerful wizard from the planet Prysmos, Merklynn longs for the ancient days of magic, when wizards like himself were revered. To this end, Merklynn used his magic to disable all technology on the planet, as well as bequeathing magic to the knights that would become the Visionaries. However, after Prysmos was destroyed, Merklynn made his way to Earth, where he took on the identity of Garrison "Blitz" Kreiger. Forced to rely on the technology he hated so much, "Kreiger" began a decades long plan to restore his world with the aid of the mystical artifact known as the Talisman. In his human guise, he manipulated the likes of Sgt. Savage, Centurion, Joe Colton, and others to fulfill his ultimate machination—remaking the world of Cybertron into a new Prysmos. Now, with his true identity revealed to all, Merklynn will stop at nothing to take Cybertron from the blasphemous machines he hates so much. Remember this. It's gonna come up again much later. When Leoric inevitably returned, right on schedule, to duel Virulina again, the sorceress casted a life-draining spell on her foe only for Merklynn to cast the same spell on her, both having outlived their usefulness to his plan. As he gloated however, Galadria unleashed a healing spell deep underground, just as Wheeljack's anti-Talisman bomb went off, which raised New Prysmos to the surface of Cybertron and threw a rather large wrench in Merklynn's plans. Merklynn's alter ego of Garrison Kreiger is based on the character of "General Blitz" from the original Sgt. 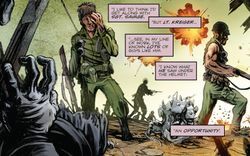 Savage and his Screaming Eagles subline of the G.I. Joe franchise. Prior to this, a General Blitz was mentioned in G.I. Joe vol. 4 #7 to have existed as an Axis leader during World War II which the Screaming Eagles fought against. However, due to Kreiger/Merklynn's history and the fact that General Blitz is never named as "Garrison Kreiger" (or vice-versa), the two have to be separate characters. 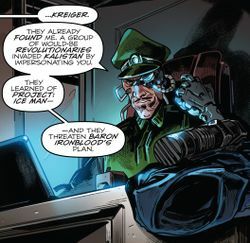 In his Hasbro Heroes Sourcebook artwork, Kreiger’s uniform is colored red, as it was on his original toy, rather than the green actually used in his fictional appearances. While the name "Merklynn" may sound like it is a play of "Merlin", the character's name and original likeness were actually based on that of Hasbro sculptor Bill Merklein, who worked as a sculptor for both Visionaries and G.I. Joe: A Real American Hero. 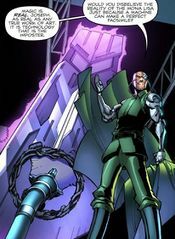 Even outside of his human disguise, Merklynn's association with the Iron Ring is fitting considering that his 1987 counterpart lived on top of the Iron Mountain. This page was last edited on 24 June 2018, at 17:01.